This January, Sony debuted its new gaming handheld in Tokyo. The portable's codename was introduced as NGP, or "Next Generation Portable". 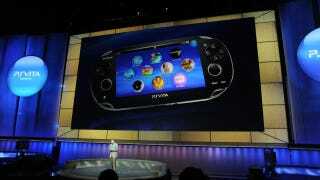 Today, at the E3 gaming expo in Los Angeles, Sony revealed the handheld's final name, PS Vita, as well as its pricing. The portable has dual touch pads, dual cameras, an OLED screen, GPS, six-axis motion sensors and a three-axis electronic compass. The portable's model number is PCH-1000; the current gen PSP's is PSP-3000. "Vita means life," said Sony Computer Entertainment Kazuo Hirai, adding that the Vita will "blur the lines" between entertainment and real life, allowing you to connect and interact like never before. PS Vita owners can get online at any of the over 24,000 AT&T Wi-Fi hotspots across the U.S.
As previewed earlier this year in Tokyo, the PS Vita has a feature called "Near" that allows them to find out what other PS Vita owners in the vicinity are currently playing and what titles are popular. Vita, pronounced "VEE-ta", will have Wi-Fi and 3G/Wi-Fi models. Sony is partnering with AT&T as the exclusive mobile carrier for the United States—an announcement that drew groans from the audience at E3. The PlayStation Vita Wi-Fi model is priced at US$249, and the 3G/Wi-Fi model is $299. Additional details about AT&T data plans and pricing will be announced later. Likewise, plans for the PS Vita's carriers outside the U.S. will be made public at a later date. In Japan, the Wi-Fi model is priced at ¥24,980, and it's €249 in Europe. The 3G/Wi-Fi model is ¥29,980 and €299. The PS Vita will successively launch in the global market at the end of 2011.